It is called Highberger House, a place for unpublished writers to live and work without distractions while they continue to pile up rejection letters. But this building is haunted by more than just the specter of failed authors: There is the ghost of a beautiful woman in the hallways who cries out in fear and desire. And there is a beast in the walls that owns her body and soul, and now fiends for… the blood of his creators. 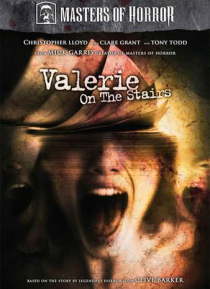 Christopher Lloyd, Tyron Leitso (HOUSE OF THE DEAD), and Tony Todd (CANDYMAN) star in this sexually charged shocker adapted from the story by Clive Barker about doomed dreams, rotted imaginations, and the horrific secret that has given life to Valerie on the Stairs.